The Trinity System delivers an even more authentic tone than the Pure pickup alone. The microphone adds extra air and shimmer to the overall sound, which is very desirable for the purely acoustic guitarist. The mic can be mixed in as much or as little as the situation allows. As a general rule, the lower the stage volume, the more mic can be blended in. This system is great for home recordings too! The Trinity Preamp allows for individual sound adjustment of the mic and pickup. It is built using K&K's "silent filter technology" and our full size component philosophy. We use full size capacitors and other parts because we find they sound better than the miniature components in most of our competitors' preamps. 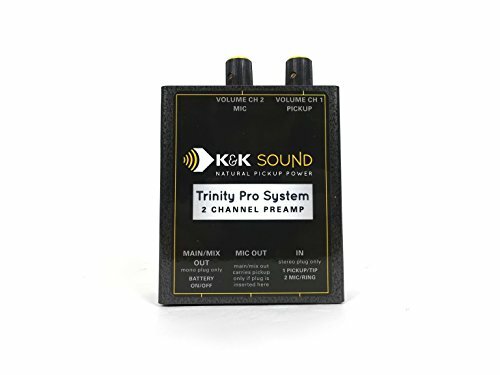 This little preamp is extremely versatile and powerful and features easily accessible volume controls and internally adjustable gain/EQ controls with +/- 20 dB bass, midrange and treble filters (trimpots) for each individual channel. You know when an amplified signal just doesn't "sound right"? In a dual-source system, chances are it's a phase-match problem when the sound waves coming from one source are partially canceling out the waves coming from another source. In pickup/mic combination systems, it's actually a very common problem that the mic is out of phase with the pickup. The phase switch allows you to simply "flip" the sound waves of the mic so that they match the pickup. The result is that "aaaaahh" smooth tone that just sounds right. An out-of-phase problem is indicated by early feedback and tinny, unbalanced sound. This may be tolerable in some tone ranges (positions on the fret board) and quite noticeable in others, even resulting in sound cancellations on some notes. If you have any questions about this product by K&K Sound, contact us by completing and submitting the form below. If you are looking for a specif part number, please include it with your message.